Taylor Rotunda is the son of Mike Rotunda, the grandson of Blackjack Mulligan. and brother of Windham Rotunda.. In 2008, Rotunda signed a developmental contract with World Wrestling Entertainment (WWE) and was assigned to Florida Championship Wrestling (FCW), where he debuted in December by defeating Caleb O'Neal. On December 16, 2008, Rotunda, wrestling under his real name teamed with Kris Logan to defeat Ryback and Jon Cutler in a tag team match. Throughout early 2009, Rotunda continued wrestling in tag team matches, and changed his name to 'Tank Rotunda' in February. In June, he began wrestling as 'Bo Rotunda' and later 'Bo Rotundo', and the following month he began teaming with his brother, Duke Rotundo. At the FCW television tapings on June 23, The Rotundo Brothers defeated The Dude Busters (Caylen Croft and Trent Barretta) to become the number one contenders to the FCW Florida Tag Team Championship. That same night, they defeated Justin Angel and Kris Logan for the FCW Florida Tag Team Championship. They went on to successfully defend the championship against Dylan Klein and Vance Archer and the team of Curt Hawkins and Heath Slater. At the FCW television tapings on November 19, the Rotundos lost the championship to The Dude Busters (Hawkins and Croft). In early 2010, the Rotundos began feuding with The Usos (Jimmy and Jules), and their manager, Sarona Snuka. In April, they moved into a feud with Jackson Andrews and Curt Hawkins, which began when Rotundo faced Andrews in a singles match and won by disqualification when Hawkins interfered. Rotundo was then absent from FCW due to injury, making his return in June. He moved into singles competition, defeating wrestlers including Derrick Bateman, Hawkins, Tyler Reks, and Brodus Clay. In August, FCW Florida Heavyweight Champion Mason Ryan issued an open challenge, which Rotundo accepted. He lost the subsequent championship match by submission. On February 3, 2011, Rotundo defeated Ryan to win the FCW Florida Heavyweight Championship for the first time, but lost the championship to Lucky Cannon immediately afterward. He regained the championship from Cannon three months later, on May 19. In July ans August, Rotundo appeared in multiple untelevised matches before WWE Raw and WWE SmackDown. On September 1, Rotundo vacated the FCW Florida Heavyweight Championship due to injury. Later that month, it was reported that Rotundo had suffered a lacerated kidney, and was expected to be absent for several months to recuperate. Rotundo returned at the tapings of the January 29, 2012, episode of FCW television, declaring his intentions to reclaim the FCW Florida Heavyweight Championship. On February 2, Rotundo and his brother, renamed Husky Harris, defeated Brad Maddox and Eli Cottonwood to win the FCW Florida Tag Team Championship for the second time. The brothers held the championship until March 15, when they lost it to Corey Graves and Jake Carter. In May 2012, Rotundo made several appearances at WWE house shows, defeating Drew McIntyre. At an FCW live event on June 16 Dallas defeated Rick Victor to win the FCW Florida Heavyweight Championship for the third time, right after Victor had just defeated Seth Rollins for the title. He lost the title back to Victor on July 13. 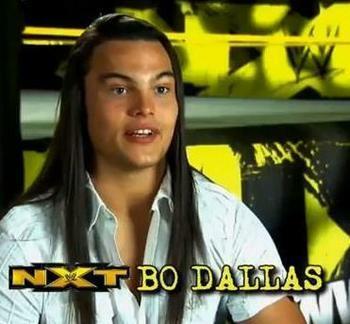 In 2012, WWE rebranded FCW as WWE NXT, and Dallas made his NXT television debut in June 20 episode of NXT, portraying a happy-go-lucky and resilient character under the ring name Bo Dallas, where he defeated Rick Victor. In August, Dallas competed in a tournament to crown the first NXT Champion; he was eliminated by Jinder Mahal in the quarter-finals. On the November 7 episode of NXT, Dallas competed in a number one contenders fatal four-way elimination match against Mahal, Drew McIntyre, and Justin Gabriel; despite eliminating McIntyre and Gabriel, Dallas succumbed to Mahal. On January 26, 2013, at WWE's Royal Rumble Fanfest, Dallas participated in a eight-man NXT tournament for a place in the 2013 Royal Rumble match; he defeated Luke Harper, Conor O'Brian, and Leo Kruger to win the tournament. The next day, Dallas entered the Rumble match at number 16, where he lasted over 20 minutes and eliminated the WWE Intercontinental Champion, Wade Barrett, who returned to the ring and eliminated Dallas. This provoked a brief feud, with Barrett challenging Dallas to a non-title match the next night on Raw, in which Dallas earned a upset victory in his first singles match on Raw. On the February 11 episode of Raw Dallas appeared, attacking Barrett before Barrett's match against Kofi Kingston. Dallas later challenged Barrett for the Intercontinental Championship, but was defeated. Simultaneously with his feud with Barrett, Dallas entered the NXT Tag Team Championship tournament alongside Michael McGillicutty. The pair defeated Primo and Epico to advance to the semi-finals, but lost to the Wyatt Family (Luke Harper and Erick Rowan) due to Bray Wyatt's interference. In an NXT Championship number one contender's three-way match against Conor O'Brian and Corey Graves, Dallas was prevented from winning by Wyatt, due to Dallas' earlier refusal to join The Wyatt Family. This resulted in a match between Dallas and Wyatt, which Dallas won. Starting in late April 2013, the NXT audience began to turn against Dallas (despite Dallas not changing his character) and started booing him. NXT Tag Team Champion Adrian Neville chose Dallas to replace his injured partner, Oliver Grey, but on May 8, they lost the title to The Wyatt Family. Soon after, Dallas' character began showing subtle villainous traits of being disingenuous. On the May 29 episode of NXT, Dallas won a battle royal to becomee the number one contender to the NXT Championship. On NXT on June 12 (taped on May 23), Dallas defeated Big E Langston to become the new NXT Champion. He successfully defended the championship against Antonio Cesaro and Leo Kruger during mid-2013. By then, the NXT audience's dislike of Dallas had grown to the point of the crowd literally turning their backs on him while cheering all his opponents, regardless of who he faced. In September, Dallas held an open challenge to determine his next title contender but banned Sami Zayn from competing, so Zayn masqueraded as the masked El Local and defeated Dallas to earn his title shot. The match occurred on the October 16 episode of NXT, and Dallas retained his title by sending Zayn into an exposed turnbuckle. Dallas then faced Adrian Neville in December and lost by countout to retain his title. In a rematch at NXT Arrival in February 2014, Dallas lost the title to Neville, and failed to regain it in a rematch on NXT on March 27. The following month, Dallas attempted to "Occupy NXT", but the crowd turned their backs on him, and he was forced into a match against Justin Gabriel, which he won. Beginning to throw tantrums after failing to get his own way, he was put in a match against Big E on May 22. Dallas subsequently lost the match and was forced to leave NXT as a result. In June, he attempted to return to NXT by appearing as the masked character "Mr. NXT", but was exposed by Zayn and forced to leave. Starting on the April 7 episode of Raw, WWE started airing motivational-style introductory vignettes for Dallas. Dallas' return to the main roster was in a winning effort, as he defeated Sin Cara on the May 23 episode of SmackDown as well as the May 26 episode of Raw. Dallas made his first pay-per-view appearance at Payback, where he was scheduled to face Kofi Kingston. However, the match never happened due to interference from Kane. Dallas would face Kingston the following night on Raw in a winning effort. Following his début on the main roster, Dallas began an undefeated streak, picking up wins over R-Truth, Fandango, Titus O'Neil, El Torito, Damien Sandow, and The Great Khali. Dallas established himself as a heel when he attacked El Torito after his match against Diego on the July 4 episode of SmackDown. At Battleground, Dallas participated in the 19-man battle royal for the vacant WWE Intercontinental Championship; he managed to eliminate Sin Cara and Titus O'Neil before being the 16th person eliminated after being thrown out by Dolph Ziggler. Dallas' undefeated streak was ended by R-Truth on the July 28 episode of Raw, prompting a small feud between the two. In late August, Dallas began tormenting Jack Swagger about his loss to Rusev at SummerSlam after Swagger's matches. Dallas began feuding with Mark Henry after defeating him on the September 29 episode of Raw, tormenting him like he did Swagger following Henry's losses to Rusev at Night of Champions. On the October 7 episode of Main Event, Dallas unsuccessfully challenged Dolph Ziggler for the Intercontinental Championship. Dallas then went on to pick up three more wins over Henry in both singles and tag team matches, before being quickly defeated by Henry in a match on the Hell in a Cell pre-show. After a four month absence due to a foot injury, Dallas made his televised return on the WrestleMania 31 pre-show in March 2015, competing in the André the Giant Memorial Battle Royal where he was eliminated by Hideo Itami. Dallas later reappeared at Extreme Rules, where he was beaten up by Ryback. 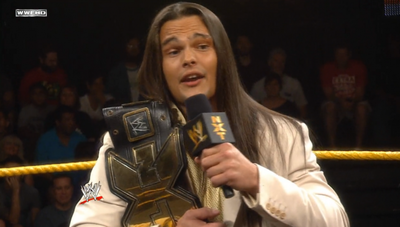 Dallas later reappeared at Extreme Rules, where he attempted to sway the crowd to his side, telling them to "Bolieve". This was cut short by Ryback, who entered the ring and easily defeated Dallas. In the Raw following, Dallas appeared to fight Ryback yet again, but was once again easily beaten. Afterwards, Bray Wyatt entered the ring and attacked Ryback.